How do you explore the interior of a planet without ever touching down on it? Start by watching the way the planet spins, then measure how your spacecraft orbits it—very, very carefully. This is exactly what NASA planetary scientists did, using data from the agency's former mission to Mercury. It has long been known that Mercury and the Earth have metallic cores. Like Earth, Mercury's outer core is composed of liquid metal, but there have only been hints that Mercury's innermost core is solid. 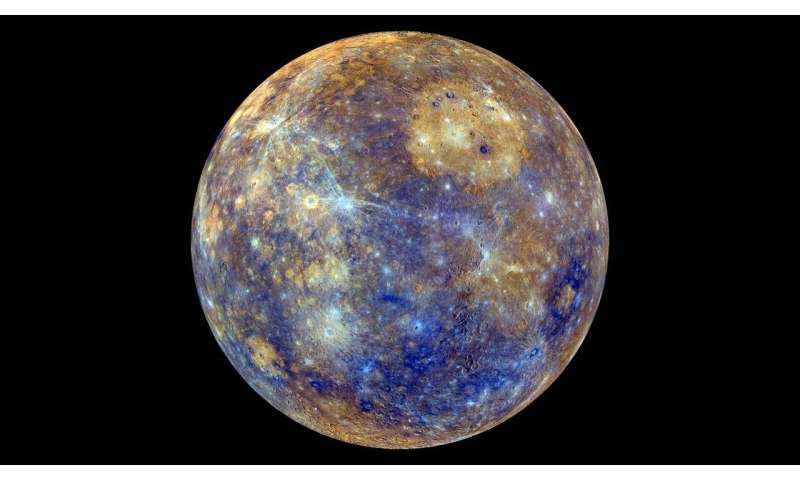 Now, in a new study, scientists from NASA's Goddard Space Flight Center in Greenbelt, Maryland have found evidence that Mercury's inner core is indeed solid and that it is very nearly the same size as Earth's inner core. The findings of Mercury's solid inner core, described in Geophysical Research Letters, certainly adds to a better understanding of Mercury, but there are larger ramifications. Just how similar, and how different, the cores of the planets are may give us clues about how the solar system formed and how rocky planets change over time. "Mercury's interior is still active, due to the molten core that powers the planet's weak magnetic field, relative to Earth's," said Antonio Genova, an assistant professor at the Sapienza University of Rome who led the research while at NASA Goddard. "Mercury's interior has cooled more rapidly than our planet's. Mercury may help us predict how Earth's magnetic field will change as the core cools." To figure out what the core of Mercury is made of, Genova and his colleagues had to get, figuratively, closer. The team used several observations from the MESSENGER (Mercury Surface, Space Environment, GEochemistry and Ranging) mission to probe the interior of Mercury. The researchers looked, most importantly, at the planet's spin and gravity. The MESSENGER spacecraft entered orbit around Mercury in March 2011, and spent four years observing this nearest planet to our Sun until it was deliberately brought down to the planet's surface in April 2015. Radio observations from MESSENGER were used to determine the gravitational anomalies (areas of local increases or decreases in mass) and the location of its rotational pole, which allowed scientists to understand the orientation of the planet. Each planet spins on an axis, also known as the pole. Mercury spins much more slowly than Earth, with its day lasting about 58 Earth days. Scientists often use tiny variations in the way an object spins to reveal clues about its internal structure. In 2007, radar observations made from Earth revealed small shifts in the spin of Mercury, called librations, that proved some of Mercury's core must be liquid-molten metal. But observations of the spin rate alone were not sufficient to give a clear measurement of what the inner core was like. Could there be a solid core lurking underneath, scientists wondered? Gravity can help answer that question. "Gravity is a powerful tool to look at the deep interior of a planet because it depends on the planet's density structure," said Sander Goossens, a Goddard researcher who worked with Genova on this study. As MESSENGER orbited Mercury over the course of its mission, and got closer and closer to the surface, scientists recorded how the spacecraft accelerated under the influence of the planet's gravity. The density structure of a planet can create subtle changes in a spacecraft's orbit. In the later parts of the mission, MESSENGER flew about 120 miles above the surface, and less than 65 miles during its last year. The final low-altitude orbits provided the best data yet, and allowed for Genova and his team to make the most accurate measurements about the internal structure of Mercury yet taken. Genova and his team put data from MESSENGER into a sophisticated computer program that allowed them to adjust parameters and figure out what the interior composition of Mercury must be like to match the way it spins and the way the spacecraft accelerated around it. 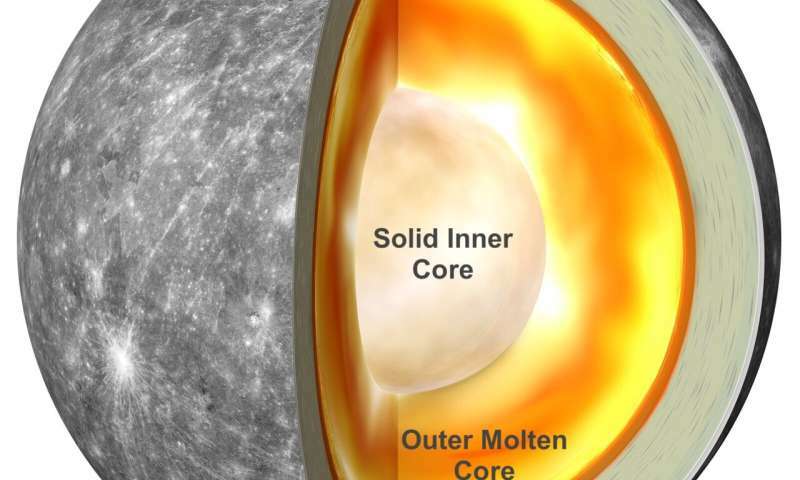 The results showed that for the best match, Mercury must have a large, solid inner core. They estimated that the solid, iron core is about 1,260 miles (about 2,000 kilometers) wide and makes up about half of Mercury's entire core (about 2,440 miles, or nearly 4,000 kilometers, wide). In contrast, Earth's solid core is about 1,500 miles (2,400 kilometers) across, taking up a little more than a third of this planet's entire core. "We had to pull together information from many fields: geodesy, geochemistry, orbital mechanics and gravity to find out what Mercury's internal structure must be," said Goddard planetary scientist Erwan Mazarico, who also helped Genova reveal Mercury's solid core. The fact that scientists needed to get close to Mercury to find out more about its interior highlights the power of sending spacecraft to other worlds. Such accurate measurements of Mercury's spin and gravity were simply not possible to make from Earth. Additionally, this result used data collected by MESSENGER over several years, information that's available for all scientists to use. New discoveries about Mercury are practically guaranteed to be waiting in MESSENGER's archives, with each discovery about our local planetary neighborhood giving us a better understanding of what lies beyond. "Every new bit of information about our solar system helps us understand the larger universe," said Genova. Glad I noticed the author's byline, I read the whole thing in Michelle Thaller's delightful voice.